Did you know that termites cause more damage in terms of dollar amount per year than all tornadoes, hurricanes, fires and earthquakes combined! 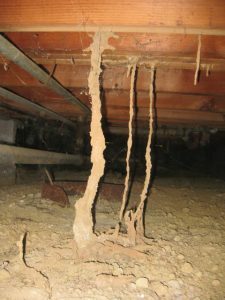 Unlike fire & weather catastrophes, however, termite damage begins slowly and may remain undetected for many years. 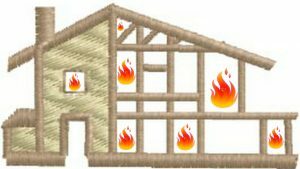 Think of termite colonies as tiny little fires burning inside your walls…. You can’t see them or smell them, but you would certainly want to extinguish them!. Most drywood termites live on the coast. One particularly destructive termite is the drywood termite which thrives in warm, moist, coastal regions. As a result, most drywood termite infestations occur in the warmer regions of the US including California, Florida and Texas. If you live in any one of these areas, your house could become an appetizing meal for these wood-destroying insects. Termite pellets are often the first sign of a termite infestation. Typically late summer is when the drywood termites swarm. Usually when the weather becomes hot and humid right after a good rain. Drywood termites live in small social colonies in dry wood. They mate and fly to new dry wood areas; enter a small hole in the wood and start to form a new colony. In the first year, colony size may be only around 50. After four years, there may be as many as 700 individual dry wood termites in one colony. At this time, the colony may swarm to start the cycle over again. 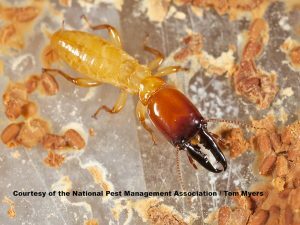 After 15 years, the dry wood termite colony will have grown to approximately 3,000 individuals. Can cause even more damage than drywood termites. 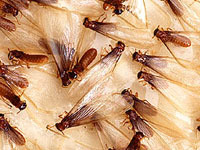 Subterranean termites live in the ground and come up to feed on the weeod members of your home. They create mud tubes/tunnels to traverse between the soil and the wood they are feeding on. The moisture in the tubes can also cause fungus to grow in the wood members and inner wall areas. 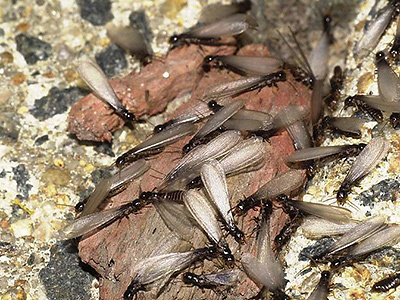 Subterranean termites also sprout wings and swarm to start new colonies, usually early Spring. But unlike Drywood termites, their numbers are great. You will sometimes see what looks like a black cloud flying by. 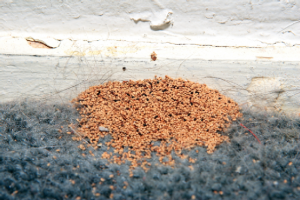 Dampwood Termites are rare in San Diego County, but we do find them occasionally in our East County Areas. As the name suggests, they prefer to live in and eat damp wood. 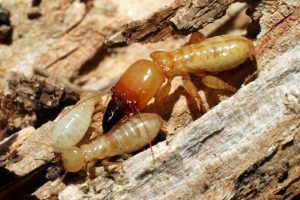 Dampwood termites are usually found in logs, stumps, dead trees, fence posts, utility poles and do not usually infest homes.